Most households in this country probably have about 10 different bottles of cleaning products designed for different purposes – the toilet, the shower, the kitchen, the furniture – you name it and some company out there is making a product that they want you to buy. There’s a reason that an entire row at the grocery store is taken up by shelf after shelf of cleaning products: we buy them all. For some reason, and I don’t know how it started, we think we need a different spray bottle for every surface in the house. It’s very strange. Why do we complicate such a mundane but yet necessary activity, the cleaning of our home? Wouldn’t it be better to simplify this and save yourself some cash? I think so. The next time you find yourself standing in front of thousands of bottles of toxic cleaners, really consider what you need to clean. All-purpose cleaners are just that – they are for all purposes! Other than some bleach, which some people choose to use in their homes, a good all-purpose cleaner cleans everything from the bathroom to the counter tops to the windows, so there is no need to buy specialty products to do each one of those places. One that I recommend to people isn’t even considered a “household cleaner” but tends to work better than most products and is all-natural and non-toxic, is Dr. Bronner’s Castile Soap. You can buy large bottles of it, dilute it, and use it to clean not only your house, but your body as well. (It’s what I use in the shower in place of regular soap and shampoo.) Organic, Fair Trade, easy on the environment – it doesn’t get much better than that. However, if you are the adventurous sort, you could even make your own cleaners for mere pennies on the dollar, while again leaving behind all the toxic stuff normally found in mass market cleaners. Don’t believe me? Try mixing equal parts of baking soda and water in a bowl to make a paste, and then use it to clean your fridge, microwave, tile counter tops, or even your toilet. Go ahead, I’ll wait. I bet it works! And how much did you spend, about $.10? Vinegar is also a good ingredient to use to make your own all-purpose cleaners, and adding in a little essential oil to a spray bottle filled with water and vinegar makes the house smell good, too. Years ago I used to have a whole bunch of different bottles under my sink for cleaning every surface in my home, and one day I was thinking that it seems awfully dumb to need different kinds of cleaners for everything. 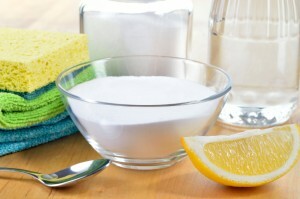 Sure, some materials need specialized cleaning products, but generally one mix can clean most everything. It is so much easier (and cheaper) to just have a select few (or 1 even!) items that can clean everything. Companies spend millions marketing these “different but the same” products to consumers, but don’t buy into the hype – you don’t need them all. Keep your money or spend it on more worthwhile items than bottles of cleaning fluid. Instead, make it yourself or pick up a bottle of Dr. Bronner’s soap and mix up a few spray bottles. It’s definitely good for the environment, it’s really good for your bank account, and it’s even better for your health. And we all know that’s the most important thing to consider. The best solution = vinegar and water all the way. I do a lot of cleaning with vinegar and hot water. It does a good job and is cheap if you do it right. I’ve been using a lot of vinegar and baking soda together the past year. The chemical reaction tears grime up so well! ~ Harefield Carpet Cleaners Ltd.